The Lord- Lieutenant and the Deputies have been in the front line of the assessing the Queen’s Awards for Voluntary Service ever since Her Majesty established them to mark her Golden Jubilee. The Lieutenancy seeks to ensure grassroots voluntary achievements across our county are recognised by the highest award of its kind. Kent is blessed with an army of voluntary organisations, run by dedicated supporters. In the past thirteen years a number of those organisations in Kent have been awarded QAVS, the equivalent of a corporate MBE. There is no deadline for nominations. They are considered at any time within three years of the nomination. You cannot nominate a group for a particular year’s Award.Visits will be made by a member(s) of the Lieutenancy who will submit a report to the national assessment panel. The Awards are published on 2 June on the anniversary of Her Majesty’s coronation. For further information click here. We should be very proud of our volunteers therefore we need to encourage as many as possible to submit an entry. 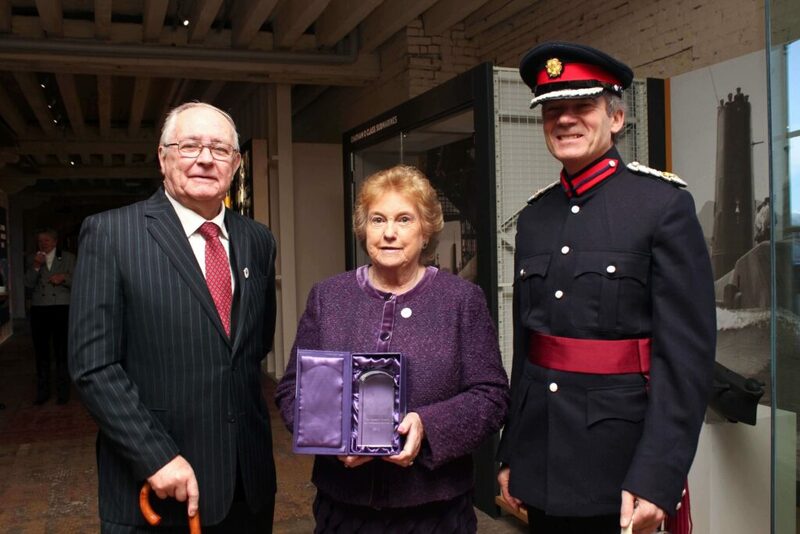 The Vice Lord-Lieutenant, Mr Richard Oldfield DL, pictured right, presenting the Queens Award for Voluntary Service on 01/11/12 to Sheila Goodhew, Chairman of the Chatham Dockyard Historical Society and Mr Brian Jenkins, President, pictured left. 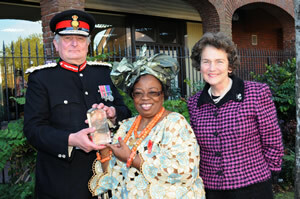 2011 - Her Majesty's Lord Lieutenant of Kent and The Viscountess De L'Isle with Tina Murphy, Director of HACO, and the coveted award.